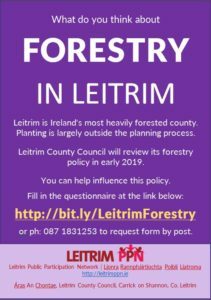 What Do You Think about Forestry in Leitrim? Leitrim County Council is preparing a review of its policy on Forestry. This is important because local authorities can only raise concerns on developments under 502 hectares if the matter relates directly to what’s in their policy. 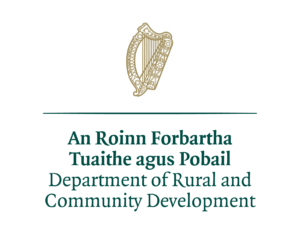 Leitrim PPN asks you to consider the issues and comment for input into a policy review process. The questionnaire looks at the current situation with regard to forestry in Leitrim under a number of different headings. It gives a brief overview of the current situation and asks for your opinions and views, evidence-based where possible, on how policy should be developed for the future. You can access the questionnaire online – CLICK HERE – or by contacting us for a document copy. or in any Leitrim Library where they have the documents on hand or will print one for you. Phone Tracy at 087 183 1253 or email info@leitrimppn.ie. Public Participation Networks provide a space for the Community Sector to influence policy decisions that affect our lives at local and national level. They are designed to be outside and in addition to the party political space. Forestry in Leitrim has become a hot topic of debate in recent months. In July of 2018, figures from the National Forestry Inventory placed Leitrim at the top of the list with 18.9% of it’s land having forest cover. CLICK HERE for full report. Environmental groups and other bodies have voiced concerns about the high level of afforestation in Leitrim and other counties. Leitrim PPN has representatives on a number of Strategic Policy Committees – SPCs. Scott Coombs and Brian Smyth are the Leitrim PPN reps on the SPC for Economic Development, Enterprise and Planning. Leitrim Council raised the review of its Forestry Policy at the July meeting and Scott Coombs rightly identified the potential for developing a PPN position on Forestry. This position will be developed from your responses to this questionnaire and must be considered when the Council draft their policy. The fact that we are seeking your views has been noted on the SPC agenda. Leitrim Council will draft their new policy in early 2019. So that we are in good time for this, please complete and return the survey by early January 2019. The results will then for collated for consideration by Leitrim Council. If you have any queries please get in touch. If you are interested in Environmental issues in Leitrim and would like to be part of a formal network in the county, CLICK HERE for more on LENs and get in touch by phone post or email.